This entry was posted on Friday, 31 October 2014 15:11 at 15:11	and is filed under Shiite sectarian federalism. You can follow any responses to this entry through the RSS 2.0 feed. Both comments and pings are currently closed. Recently, I have noticed similar heightened tensions in the usual online exchange of comments, and debates, and particularly among the pro-Shia team. They are becoming more aggressive in their rhetoric, and agitating in their actions. Recently, a group went on the famous Minaret of Samarra (the Spiral Minaret), wrapping around it a black banner symbolizing Ashura, and raising a flag on top commemorating Imam Hussein. This resulted in vicious exchange from both sides to levels that I have not seen before. By the way, Saddam Hussein was a fan of Nebuchadnezzar, a Babylonian king. I don’t remember him or anyone else referring to the Sumerians during that era. The anti-Persian, anti-Jewish propaganda Saddam had led exploited historical narratives that resonated with it. There are some references to Sumerian symbols being exploited by the Baath in Amatzia Baram’s work I think. Agreed that other pre-Islamic cultures (also including Assyria) received more attention. I was just reading a Reuters report that the mass graves are back in Iraq – courtesy of the Sunni Arab Isis. But this time the victims aren’t Shiites or Kurds – but Sunni Iraqi members of a particular tribe in Anbar. It took me back to mid 2012 when you had a host of Sunni Iraqi commenters here raging against Dawa and the Maliki govt and for months threatening civil war unless Maliki was deposed. By August 2012 Maliki was safe and your Sunni Iraqi commenters all disappeared from this site – as far as am aware have not returned? 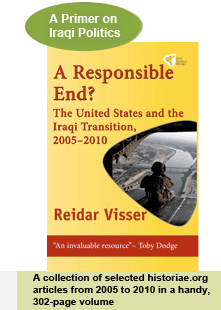 Where are they now – eg Observer, Santana, Faisal Kadri to tell us all about Isis and how the Sunni Iraqis used the withdrawal of the US to reignited the salafi/Islamic State of Iraq and their Baath fellow- travellers throughout 2013 – suicide bombing thousands of Shiites and eventually surrendering Anbar and Mosul to Isis in 2014? Little wonder if the shiites are beginning to seriously consider secession. Now that Obama and the US Dem Admin have abandoned Iraq the shiites have nowhere to turn for long term protection against Sunni genocidal fascism except Tehran? Do they RV? Hi Bb, the answer could be provided in your own argument. The relatives of those Sunnis that were massacred by ISIS aren’t particularly attracted to them either – and hence form a potential ally for the Iraqi Shiites to turn to. In 2005, I was talking to a secular liberal Iraqi of Shia background about the troubles, which included car bombing massacres of ordinary bystander Shia citizens in Kadamiya and Hillah. Interesting. As most proto-nationalist discourses, it’s also empirically wrong, since there were also Shia tribes with semi-nomadic lifestyles at least in the south. But there’s an fascinating parallel to the discourse of the Shia of Saudi Arabia, which historically has been far more upfront separatist, referring to their “greater Bahrain” homeland stretching from the island of Bahrain along the Hasa coast all the way to Kuwait and Basra. They, too – and empirically perhaps more correct – paint a picture of themselves as age-old sedentary peoples, exposed to the Wahhabism of the desert people. The Shiites will not secede despite the rise of ISIS, the majority of them in the south want an united Iraqi state so does the Sunnis however under the condition they have a say in the formation of government and national resources. As for the Kurds, they used the rise of ISIS to claim territory that falls under s.140 of constitution and beyond. The end game will be: the central government once it hopefully restores the lands under ISIS, will pursue decentralization while maintaining national resources at the centre (i.e. Baghdad) .